There is something so special about the St Chapelle – this stunning cathedral is world renowned for its stained glass windows. However it is not only the windows that are worthy of seeing, the history alone of how this cathedral came to be built by King Louis IX is astounding. Walking in the light of St. Chapelle you will have a terrific understanding of that went into not only the construction of the cathedral, you will learn how incredibly challenging the restoration of this magnificent building was when it was finished in 2015 after seven years of painstaking work – just in time to celebrate its 800th anniversary. 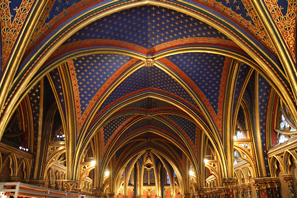 After St. Chapelle you will make your way to Notre Dame to learn the history of this incredible cathedral. You will not only learn the history, you will go inside to see the perfect design of this gothic masterpiece. After touring inside you will make your way straight to the front of the hours long queue to climb to take in the view from the infamous bell tower of Notre Dame.